Project obstacles and solutions: The East End Crossing Tunnel is a key to completing the East End Bridge that connects I-265 in Louisville, Kentucky across the Ohio River with its northern section in Utica, Indiana. The tunnel burrows under U.S. 42 and the historic Drumanard Estate; a distance of 1,700 feet. The tunnel is actually two tunnels: one for northbound and one for southbound traffic. As the tunnels were being blasted, IMI supplied a coarse, wet shotcrete to secure the ceiling and walls. After the tunnels were completely opened up, IMI supplied a finer shotcrete that was applied prior to the waterproofing liner and finished walls were poured. 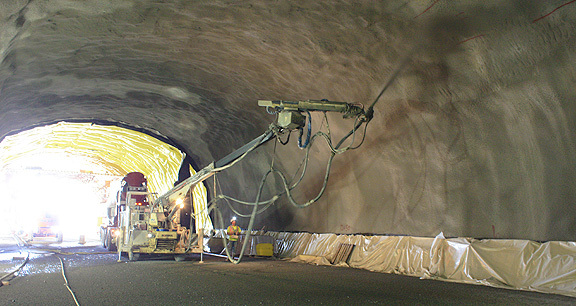 The shotcrete was sprayed on pneumatically to fill in holes and to provide stabilization in the tunnel. The mix contained a blend of fine aggregates. Where more stability was needed, steel fiber was added to the shotcrete to secure the tunnel walls and ceiling. IMI supplied 11,000 yards of shotcrete for the two tunnels and the approaching walls. Handling water drainage in a tunnel is imperative. Not only could a rain event cause flooding in the tunnel, water will continually seep from the ceiling. Walsh Vinci built a subsurface drain that channels water away from the tunnels. These were set in place and then covered with a flowable fill from IMI. Subsurface stone was then placed over the drains before the flooring surface was poured. The tunnels were poured with 20 inches of reinforced concrete. This provided a durable driving surface. IMI supplied 10,000 yards of concrete for the two tunnel roadways. For more information on shotcrete or building roads with concrete, contact the IMI sales representative near you. Click here.